Presented by WA Thompson, Coors Distribution, Inc, Southwest Construction, KSI and Lewis Luther Construction. Sign Ups are now open for Mutton Busting at the Emporium Western Store until Saturday, June 9th. Children must be 5 years old and no more than 50 lbs. Miss Rodeo Glennville Speech and Modeling Brunch, Thursday, June 7th at 10 AM in the GMVA Community Hall. Cost $10 per person. Miss Rodeo Glennville Horsemanship Competition: Thursday, June 7th at GMVA Rodeo Grounds. Competition begins at 4 PM. Then join us for the Glennville 4-H Fundraiser Dinner at 6 PM in the GMVA park. All proceeds support the Glennville 4-H Club. GMVA Jackpot Roping; June 9th Produced by Thunderhead Ranch (Paul Mullins) Sign ups at 9am, roping at 10 am. Draw(3 for $40); #7 Hdcp. (Pick 1/draw 1 – 3 for $40) #5.5 Pick or Draw (3 for $40), Buckles to Average Winners! 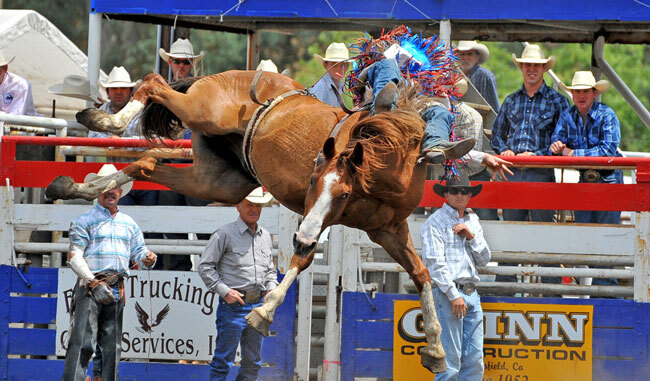 Lauren Small Barrel Race, Saturday, June 9th, Produced by WCBRA, Tina Bird (661-342-8502). Times only begin at 4 PM. Races begin at 7 pm. $1000 added money, Buckle to Champion! Rodeo Dance: Saturday June 9th at 8 PM featuring Gregor Ross. Tickets are $5 at the door. ID for Alcoholic purchases is required. Mutton Busting Registration at 12 noon (Sign-ups at the Emporium Western Store from May 9-June 9th. Cost is $15 per entry. All contestants must have a signed Liability Waiver. )Only one child per family. Must be between the ages of 5-8 and weigh no more than 50lbs. Contestants will receive a souvenir T-shirt, trophy, and one complementary ticket to the rodeo. Tickets given at registration. Presented by WA Thompson, Coors Distribution, Inc, Southwest Construction, KSI, and Lewis Luther Construction. Presale tickets for adults $12.50, children $8 and are available on our website or at the Emporium Western Store. Tickets at the Gate are $15 for adults and $10 for Children (3-12). Children under three are free.